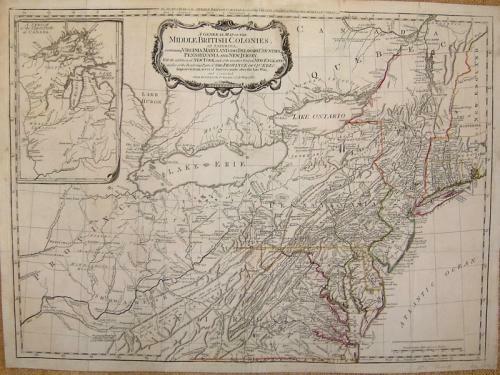 Title: 'A general map of the middle British colonies in America...', published by Sayer and Bennet. Sayer & Bennett's 1776 edition of Evans' seminal map. With John Mitchell's map of North America, the Evans map is considered the most important American map of the 18th century. Both maps were political in nature and were intended to spur western expansion into the Trans-Allegheny, Ohio Valley and the regions westward and in response to French encroachments. Evans' map became the standard for nearly 50 years, being re-issued in this and other pirated editions by Jefferys, Bowles, Kitchen and others. The map is a milestone both for its political significance and extension of cartographic knowledge in the region. The cartographic importance of the map and its place in the history of cartography are substantial. The map is in very good condition with a couple of small reinforcements to the folds at the verso. Ref: McCorkle 776.10; Stevens & Tree 30(g). LEWIS EVANS: was born in Wales and emigrated to Pennsylvania in 1736. He worked as a surveyor and draughtsman in Philadelphia, where he became associated with prominent and farsighted individuals who were interested in various aspects of natural history, exploration and publishing. He accompanied the botanist John Bartram, on a wilderness trip in 1743. Evans realised the importance of French exploration and settlement of the Ohio River, Great Lakes and other western lands, bringing them to public notice by a series of maps published in 1749 and 1755. Evans died in Philadelphia in 1756. Evans' General Map of the Middle British Colonies was initially published in 1755. Authorised editions were published in 1760, and to accompany Pownall's 'A Topographical Description of....North America. The importance of this map was recognised by many private publishers, who pirated editions of it as late as 1816.